This feature allows you to perform additional verification of outgoing tolls on international calls. Especially in the case of a single phone being shared among multiple users, this feature enables individual accountability on each user’s account. Note that calls between IP Centrex extensions and calls to other IVR applications (e.g. to voicemail) bypass the additional authorization. · Name – specify the IVR application’s name (e.g. Corporate PIN Authentication). · Application type – choose Pass-through IVR. 4. On the Voice application panel, go to the Authentication, Authorization, Accounting section. 5. 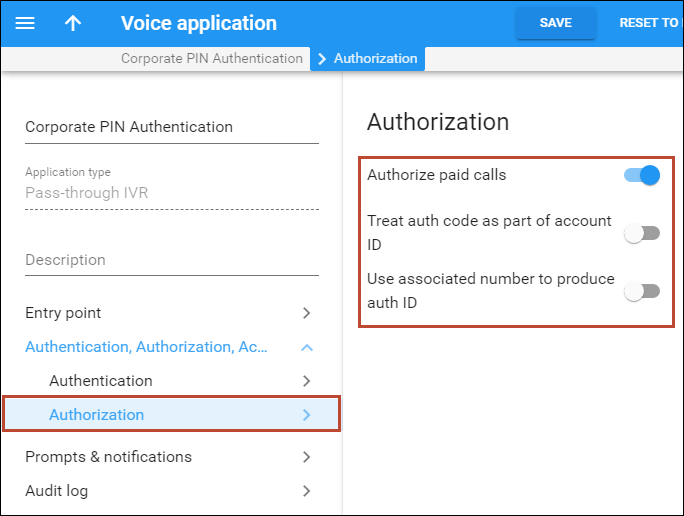 On the Authorization panel enable the Authorize paid calls option. This will enable additional authorization for toll calls. This step is only required if you have not previously defined the required destination. 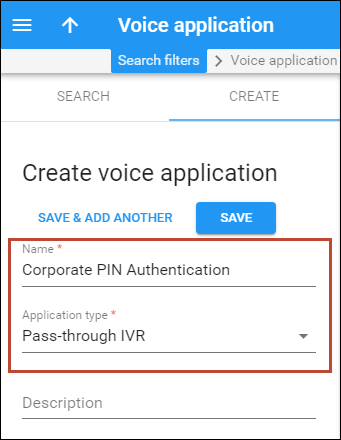 In that case, you will need to create an UMIVRPASS destination for calls to the Pass-Through IVR application. 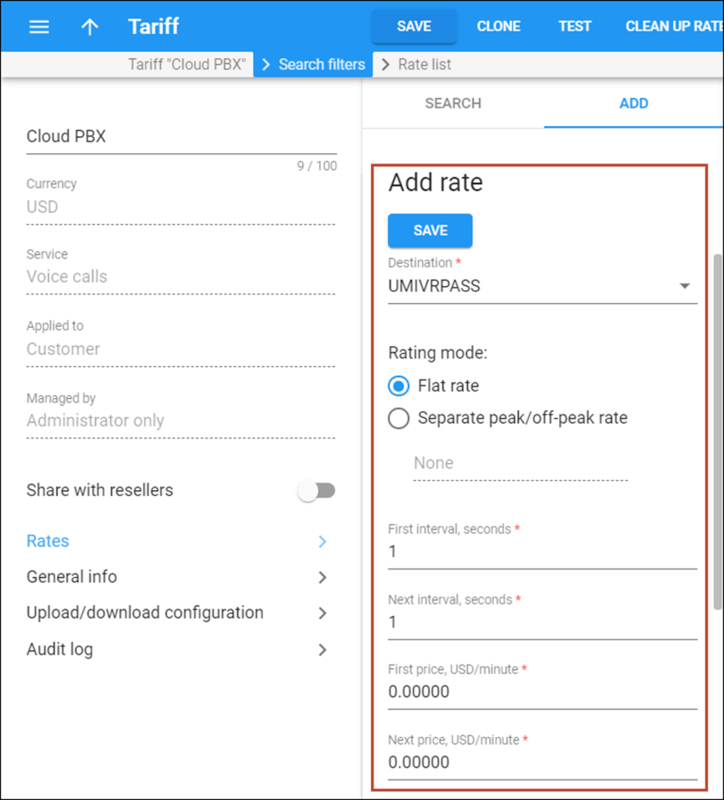 · Prefix – Type in UMIVRPASS. · Description – Enter useful information about the service being provided (e.g. Pass-Through IVR application), since this is what your clients will see on their xDR Summary pages. For a customer to be authorized for an outgoing call, they must first call the IVR application. To make this happen, add the UMIVRPASS destination you have just created to the customer tariff. 1. On the customer tariff’s panel, click Rates. 2. 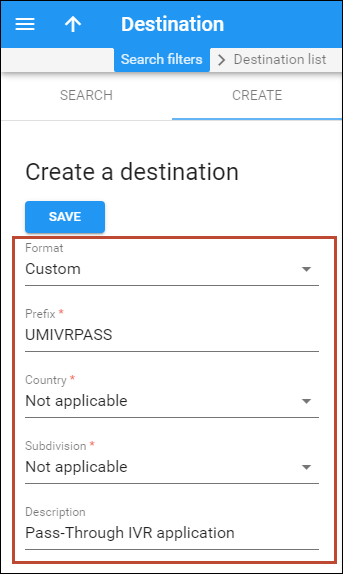 On the Add rate panel, select UMIVRPASS in the Destination field. Specify a zero price in the First price and Next price fields. This configuration requires a credit limit for the customer. If you have already set the credit limit for the customer, you may go directly to the Accounts panel to continue the configuration. Otherwise set a reasonable credit limit for the customer. 1. Go to an account that requires additional authorization. On the Edit account panel click Services, then click Service configuration. 2. On the Service configuration panel, select Voice calls and click on the Outgoing calls link. 3. On the Outgoing calls configuration panel, enable the Call via IVR option, then select the above-created Voice application and click Save. 4. 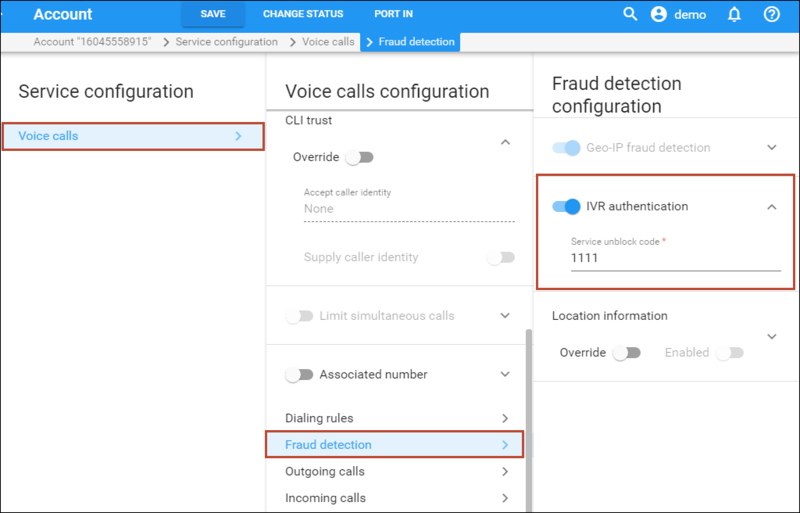 On the Fraud detection configuration panel, enable the IVR authentication option, then specify the authentication code that the account user should input to make a toll call. Click Save. This example shows you the configuration for the following scenario. Customer has a shared phone line, 12121234567, in the office hall. Every office worker has their own authentication code for making toll calls (e.g. 7614, 1027, 5423, etc.). When an employee makes a toll call, they are prompted to enter an additional authentication code (7614, 1027 or 5423) to specifically identify who they are so that calls can be properly authorized against individual accounts and later shown on a combined invoice. When one of the employees makes an outgoing call to another SIP phone within the same IP Centrex environment or makes a toll-free call, the call is then initiated without additional authorization. In this scenario, only the main account, 12121234567, is provisioned on the SIP phone. For user identification, additional accounts should also be created with IDs that include the phone number followed by the # symbol and an authentication code (e.g. 12121234567#7614, 12121234567#1027 or 12121234567#5423, etc.). 1. This configuration requires a credit limit for the customer. If the credit limit is already set you may go directly to the Account Info page to continue the configuration, otherwise set a reasonable credit limit for the customer. 2. Repeat the Configure an IVR application, Create destination and Modify a customer tariff steps from Example 1. · Authorize paid calls to enable additional authorization for toll calls. The IVR application will request that the account user should input the authentication code. 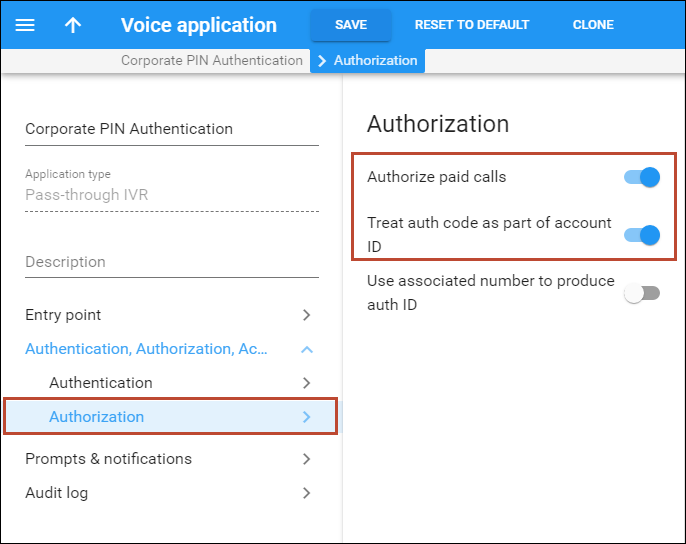 · Treat auth code as part of account ID for billing outgoing calls to separate accounts which are made from a shared phone. 4. On the account’s panel click Services, then click Service configuration. 5. 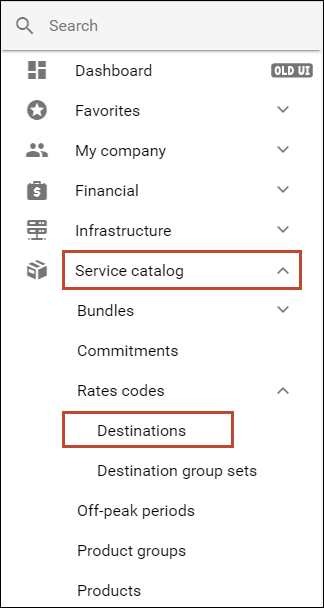 On the Service configuration panel, select Voice calls and click on the Outgoing calls link. 6. 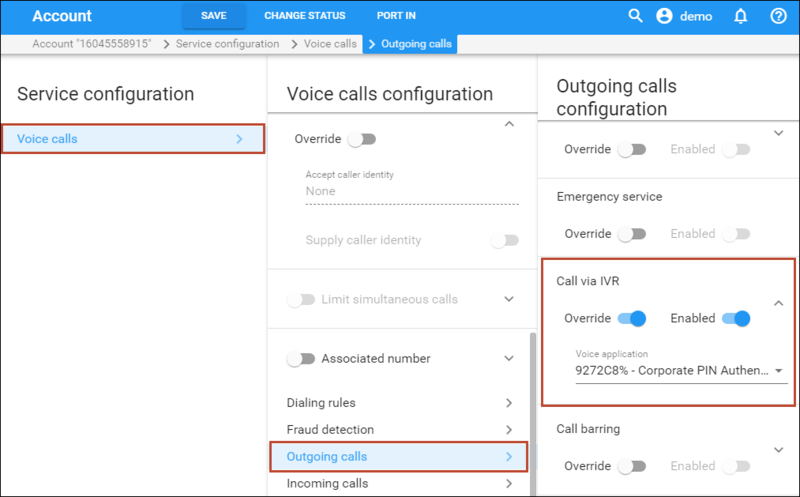 On the Outgoing calls configuration panel, enable the Call via IVR option, then select the above-created Voice application and click Save. 7. Create additional individual accounts that include a phone number followed by the # symbol and an authorization code (e.g. 12121234567#7614) and click Save.